It's 1975 in Paisley. A little boy is playing in his garden, and he's excited because his granny has knitted him a really, really long scarf that makes him look just like Doctor Who. He wants to be the Doctor when he grows up. In fact, he tells everyone, he will be the Doctor when he grows up. It's just a little boy's dream. Harmless, really. Fast-forward to 2005 in Cardiff. A grown-up man is excited because he has just seen the new Cybermen for the first time. He is playing Doctor Who in the new series, and is telling everyone it's the most thrilling thing that has happened to him ever, ever. It was all a little boy's dream. A dream that came true. Let's start at the very beginning. How did you get into the acting business?I just always wanted to do it, from before I really knew what it was! I just decided, at a very young age, that that was what I was going to do. And my parents weren't very sure of the idea because, y'know, I was very small and why should they imagine I'd stick with it? But I did and it hasn't changed since then. I went to the Royal Scottish Academy of Music and Drama and di three years in conjuction with Glasgow University, which means that I've actually got a degree from Glasgow University, even though we only did one day a week there. So that was my training. Went in at 17, came out at 20, and have been doing it ever since. What was your first job after you finished your training? 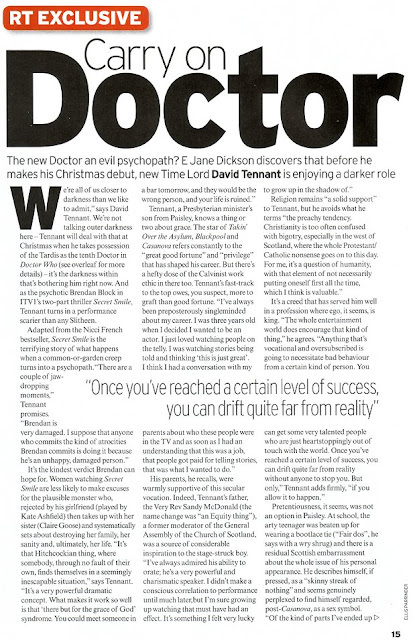 The world's most famous womaniser meant little to Blackpool star David Tennant until he arrived in Manchester. "To be honest, I didn't really know much about Casanova," confesses the Scottish-born actor, who played Det Insp Carlisle in the BBC1 "Las Vegas of the North" drama. But David soon got up to speed while filming the title role in Casanova (BBC3, 10pm Sunday), a new three-part series shot in and around Manchester and on location in Dubrovnik and Venice. Produced by the city's Red Production Company, in association with Granada, the script is by Manchester-based Russell T Davies. "My first experience of him was reading Russell's script," explains David, 33, "which wasn't what I was expecting. In the script he's not a lothario and he's not really a ladies' man. He's just someone who's passionate about the women he's passionate about. He's not sneaky or conniving or dishonest to any of them. Sitting on the bus the other day, actor David Tennant got a fright. Looming above him as he gazed out of the window was a billboard with a giant photograph of himself. He was draped by two women and looking smoulderingly at the bus passengers as if he'd love to rip their knickers off. There's one of these posters as you come out of Bristol on the Wells Road, and they're popping up all over the place - a bit like the 33-year-old actor: a role in the new Harry Potter movie, heaps of praise and award nominations for his work with the Royal Shakespeare Company and National Theatre, a star role in the recent BBC musical drama Blackpool, and now baring his all for art in the Beeb's new big glossy biopic Casanova in March. The three-part drama, portraying Casanova as an "18th-century Jeffrey Archer", rather than randy, womanising misogynist, is getting a big build-up - as the crop of billboards prove. From Casanova to Harry Potter via the Edinburgh stage: a new Scots star rises.